COMMUNIST Party of India General Secretary A.B. Bardhan has grown up with the party. He became its member during the student movement in the late forties. As the General Secretary of the All-India Trade Union Congress, he headed the All-India Federation of Electricity Employees for three decades. THE welfare of human beings is final reference point in judging the impact of what we do or fail to do. Women have an essential role to play in the development of sustainable and ecologically sound system of natural resource management. THE new Deputy Chairman of the Planning Commission, Montek Singh Ahluwalia, reversely ties his turban — the top fold goes to the left instead of the usual right to left. This had remained a mystery for sometime. Some called it superstition while few thought it brings good luck. BELOW is an email I received from an Indian woman, married to an Indian residing in the United States. Her case is not the first one of its kind I have come across here. In fact it is indicative of a deep malaise and needs a coordinated response from all of us. The identity of the person concerned is fully protected for security and other reasons. MUZAFFAR (name changed) is a handsome 22-year old who lives in a middle class Srinagar locality. Over the past couple of years, he has developed a close friendship with a married woman of the neighbourhood who is separated from her husband. THE long-awaited civil investiture ceremony at the Rashtrapati Bhavan will be finally held on June 30. Many of the who’s who (bestowed with the Padma Shris, Padma Bhushans and more) who were on vacation to far-flung places at this time of the year are said to be rushing back home, to be in time for the award ceremony. COMMUNIST Party of India General Secretary A.B. Bardhan has grown up with the party. He became its member during the student movement in the late forties. As the General Secretary of the All-India Trade Union Congress, he headed the All-India Federation of Electricity Employees for three decades. In an exclusive interview, Bardhan says that Prime Minister Atal Bihari Vajpayee’s statement on Gujarat Chief Minister Narendra Modi is meaningless and hypocritical. Q: The Opposition has criticised the Congress of double standards over the inclusion of tainted persons in the Union Council of Ministers. A: Nobody boycotted Parliament for that reason. The BJP not only had charge-sheeted ministers but one of them was also in charge of the same CBI which was supposed to be prosecuting him. And yet no Parliament session was held up for this reason. Therefore, the BJP is the last organisation which can claim to be standing on high moral ground on the issue of charge-sheeted ministers. We have made our stand clear that we don’t appreciate the inclusion of tainted ministers. When Indrajit Gupta was the Home Minister, he had not accepted Taslimuddin as Minister of State in his department and the latter had to quit. The present government is a coalition to keep the BJP out of power. Q: If the government fails to keep its promise, would you still continue to lend outside support? A: In the first place, we are supporting the government to protect the secular, democratic polity of the country. On economic policies, we do have differences with the Congress and certain other allies. That is why we have undertaken the collective exercise of preparing the Common Minimum Programme. This does not address itself to the basic differences on economic policies but confines itself to the immediate needs of the people and to undo the mischief that was wrought by the previous regime. Q: What is the danger if the BJP returns to power? A: The communal forces have not laid down their arms. They have been defeated but not ended. Therefore, it is necessary to continue fighting them ideologically, politically and practically. With five governments in their hands and as the main Opposition in Parliament, there is always a danger of their returning to power if the UPA government does not deliver the goods. This is what is motivating us to lend our continued support to the UPA government. Q: What will the Left achieve by supporting this government? A: We would like this government to clear up the path for advancing agriculture, preventing wholesale disinvestment and laying down the ground work for economic growth with social justice. It should also address itself to the most worrisome issue of unemployment. Q: Is there a growing feeling in the Left that Prime Minister Manmohan Singh is not accessible? A: The Prime Minister is the most accessible person. We have no complaints on that score. Q: Doubts have been raised over the life-span of the Congress-led UPA government. How much time do you give the new regime? A: I commend the Opposition to continue sitting there for at least five years. For the benefit of all, we, the Left, will ensure that the government lasts its full term. No doubt, there are differences but just as every dispute between husband and wife does not lead to a divorce, these would not lead to the fall of the government. Q: There has been a constant demand from the Left parties and some other allies for Narendra Modi’s removal. If that does not happen, are you in favour of invoking Article 356 in Gujarat? A: We are against the use of Article 356 to remove him. In fact, we think that the BJP itself will be compelled to remove him. Q: Are you seeking a fresh clarification from the government on Iraq and the inalieanble rights of the people of Palestine? A: I think the CMP has made amply clear the government’s attitude towards Iraq and Palestine. Any ambiguous statement made on the spur of the moment cannot change the CMP’s basic approach. The Left will not allow it. Q: Should India break free from the so-called strategic relationship with the US and Israel? A: India should have friendly relations with the world’s most powerful military and economic power but not allow them to dictate terms to us or expect us to hold on to their tail. Q: Your national council adopts various resolutions on burning issues. How do you intend convincing the government to fall in line? A: We don’t expect the government to follow the Left. The CMP is not a Left but practical political programme on urgent issues which had been messed up by the earlier regime. Q: With just 10 seats in Parliament, will you be able to influence the government on key policy issues? A: I have never overestimated our influence on the government. I am very realistic in this matter. The aim of our party would be to further develop its strategy, expand its base and further strengthen its links with the masses. Q: What is your position on the Women’s Reservation Bill? A: This time we want the Bill to be introduced, debated and passed and those who oppose it should have the maximum opportunity of putting forth their views, objections and move amendments. We would welcome if a consensus can be reached and a real solution found. Q: What about the opposition of the RJD and some others to quotas? 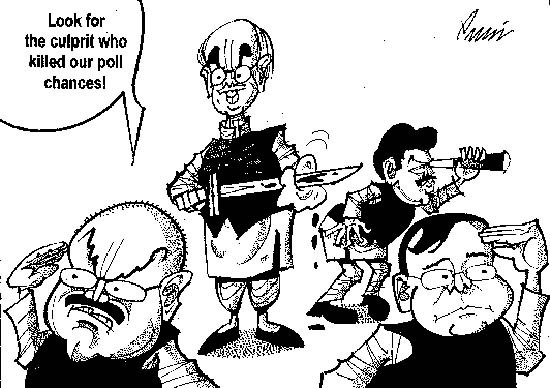 A: There is no question of tackling people like Laloo Prasad Yadav. They are opposed to the Bill and are entitled to their opposition in Parliament. We had agreed to this when the CMP was adopted. Q: Are you satisfied with the package announced by the government for farmers? A: It will go a long way in mitigating the plight of farmers which compels many of them to commit suicide. But I would have liked if some debt was written off or paid by the government. The positive side in the announcements is the move to double rural credit within three years. While maintaining and ensuring food security for our people, we should certainly diversify agriculture towards horticulture, floriculture and sericulture. We have always said that the withdrawal of all quantitative restrictions and lowering of customs duty indiscriminately on specific crops has caused immense harm to our country and hit the peasants very hard. THE welfare of human beings is final reference point in judging the impact of what we do or fail to do. Women have an essential role to play in the development of sustainable and ecologically sound system of natural resource management. Globalisation brings with it potentially large benefits as well as risks. The challenge is to manage the process of globalisation in a manner that it promotes environmental sustainability and equitable human development. Women’s work and lives all over the world have long been intertwined with food. In every country, it is women who assume primary responsibility for preparing and serving meals, for rearing children, ensuring resources to meet children’s needs for nutrition, healthcare and schooling. They are also the main managers of essential household resources like clean water, fuel for cooking, heating and fodder for domestic animals. Thus , they are caught in the intricate web of poverty and environmental degradation. The daily survival needs of predominant rural households are dependent on biomass — food, water, fodder, fuel, manure and fertilisers for agricultural purposes. Availability of water, which is directly related to the biomass in the country where monsoons are uncertain is the most crucial resource affecting the lives of rural women. The study of rural water supply scheme in Andhra Pradesh revealed that the irrigation schemes have adversely affected the drinking water supply and thus women too as primary carriers of water. A major factor in improving life expectancy in India has been the provision of potable water. The struggle for safe, clean water has been women’s daily struggle. Women face problems like work burden, lack of property, unequal distribution of food and other resources within the family, duality of roles, poor health delivery system , inferior social status and their total lack of control over cash and productive resources. These problems get accentuated by environmental degradation. Though women play a major role in the livestock economy, the government has paid little attention to the protection of fodder. Various social forestry schemes have not resulted in benefits commensurate with investment. Promotion of fodder on farmlands helps only those who own land while all others are left to fend fodder themselves. The existing social forestry projects have largely failed women. Besides being insensitive to women’s household needs, there has been no serious attempt to expand her job opportunities. The tribal women also need clear rights to forest produce. Women have an essential role to play in plantations and social forestry programmes. The new strategies to alternatives to fuel and fodder must enlist women’s needs as they are the biggest lot to be greatly affected. Therefore, environmental conservation is fundamental to the development process. But the gap between intent and reality is very large indeed. The women of marginal cultures like tribal and nomads encounter the maximum threat of environmental degradation. In the production areas, planning has to be capable of assuring the productivity at a commercial level, making proper use of the natural resources and considering the improvement of the quality of life of the local population as well as preservation of the environment. Women farmers tend to use and perfect traditional cropping methods developed overtime to protect and preserve the natural resources. This makes them the key players in the conservation of soil fertility. In Ganganagar district, the Granary of Rajasthan, where I was the Collector and District Magistrate for two years, the increasing use of fertilisers and pesticides, intense and concentrated mechanisation, crop exploitation caused such an impact on soil, forests, inland water, and biological balance of pests and diseases that they cannot but trigger the people’s awareness. The modernisation of agriculture has brought about significant changes in labour relations, with new dynamics in the labour market. In Punjab, the economic policies adopted have resulted in a gradual increase in the size of property and inland concentration. The smallholder units continue to be swallowed up by the larger ones and acquire a more mercantile nature. Simultaneously, rural hands are either overworked or, alternatively, part of the family acquires the status of temporary wage earner, and the migration of some members of the family is rendered almost compulsory. As an alternative for survival, smallholders either sell their land and attempt to purchase another property in the agricultural border areas. In Ganganagar, being the border district sharing 210 km of international border with Pakistan, women are generally the most stable members of the community, as men often migrate in search of greater economic opportunities leaving women to manage the fields and thus have a greater role to play. Efforts aimed at rehabilitation of ecologically sensitive areas should take into account the burden of work of rural women, especially the women in hilly areas where the ecological destruction is at its worst and the work burden is the highest. Efforts at the government level like promotion of new technology like biogas plants, fuelwood plantations and fuel conservation through use of smokeless chullas, hand pumps etc. will considerably reduce the rigours of rural living. However, women should be involved in the implementation of various schemes those impact them. Men and women need to be alerted to the threats of globalisation. Gender sensitisation and humanising the process of liberalisation and globalisation would not only improve “our” today but also protect and preserve the environment for “others” tomorrow. National policies need to be reformulated to accelerate democratisation and gender sensitisation to keep pace with globalisation. They should focus on increased accountability and transparency in the formulation and implementation of public policy. We need to adjust and institutionalise social policies to cushion economic dislocations leading to the marginalisation of the women and the poor. It must be recognised, however, that the autonomy of the state to act deliberately to protect the environment or to cushion the impact on the women or other changes brought about by globalisation is limited by the need to compete in the global economy for capital, jobs and markets. THE new Deputy Chairman of the Planning Commission, Montek Singh Ahluwalia, reversely ties his turban — the top fold goes to the left instead of the usual right to left. This had remained a mystery for sometime. Some called it superstition while few thought it brings good luck. Inquiries, however, revealed, the practice of reversely tying the turban was in vogue in Peshwari Sikhs and Montek just followed it; perhaps it is more convenient. The turban’s direction has, apparently, no link to his meteoric rise in career. Montek is among few exceptions to have risen to top positions in the bureaucratic hierarchy even though he does not belong to the exalted cadre of IAS. His field has been economics and he made a mark as an economist not only in India but in the world, reaffirming the belief that a technocrat does a better job than a bureaucrat. Sixty-one-year-old Montek had closely worked with Prime Minister Manmohan Singh when the latter held the reign of the Finance Ministry. As the Union Finance Secretary, Montek had seen those grueling pre-reforms years when changes were sought to be made in an obsolete system, dominated by red-tapism and “permit-quota raj”. Those were trying years when many of the ideas that are widely accepted now were being put in place in the face of a great of deal of political opposition, says Montek. It took a long time to bring around those circles to the same ideas and convince them of the need to explore the vast unutilised potential of the Indian economy. Earlier, Montek was Joint Secretary in the PMO, handling economic matters, during Rajiv Gandhi’s tenure as the Prime Minister. Seeds of reforms were sown at that time. The 1991 reforms were a major step in that direction. Few persons have known the present Prime Minister so well as does Montek. He is fully abreast of Dr Manmohan Singh’s thinking on economic issues and knows his mind. Even before the new Prime Minister thought of making Montek Deputy Chairman, Montek had been quoted as saying from Washington (where he worked with the IMF): “Dr Singh has long cherished the ideal of transforming India into a prosperous, modern, secular and socially just society and he knows what we need to do to succeed in this endeavour”. He further says, “the new PM is firm in intent and keen to listen to dissenting views and to extract them from seeds of truth which would help to improve policy”. Montek is absolutely right; listening to dissenting views and reconciling them is going to be a daunting task for Dr Singh. From being Joint Secretary in Rajiv Gandhi’s PMO to Planning Commission Deputy Chairman, Montek has come a long way. Yojna Bhavan is not new to him. Prior to his stint in IMF, he was a Member in the Yojana Bhavan and of the Economic Advisory Council to the PM. He had worked practically in all economic ministries. Besides holding the post of Finance Secretary, he was Secretary, Department of Economic Affairs; Commerce Secretary, Special Secretary to the Prime Minister; and Economic Adviser, Ministry of Finance. Montek had a brilliant academic career. Having completed his BA (Hons) in Economics from Delhi University, Montek went to Oxford, obtained Masters and did M. Phil. “Reforming the Global Financial Architecture” is notable among many of his publications. His achievement in the sphere of economics was also recognised by the Khalsa Panth and eight years back, he was decorated with the order of “Nishan-e-Khalsa” along with 80 most prominent Sikhs of the century. Montek is fully conversant with the process of reforms, pitfalls of the Indian economy, its achievements and failures and, of course, the unfinished agenda. He firmly believes that Indian economy has tremendous unutilised potential which needs to be converted into reality in spite of coalition politics. Few know that Montek’s wife, Isher Judge, too is a top economist and currently Visiting Professor at Maryland School of Public Affairs. She was Director and Chief Executive of the Indian Council for Research in International Economic Relations till she left India to join her husband in the US. She too may be returning to India along with her husband and sure to reinforce his job at the Planning Commission. “According to this advertisement, my husband was supposed to be a well-settled professional, having no financial problems and not dependent on anybody. When we responded to the advertisement, my husband’s father visited our home along with photographs of his son and his entire family. After a few days, he called his son from America, and visited our home with him and his other relatives again. Even in the newspaper and also by the father, we were told that the boy was working as a business executive in the US. Thereafter, they invited us to their ancestral residence in Delhi. Omita is already here in the US...to fight back without sufficient resources. But the point is, that these situations are far too many these days. We need a well publicised and credible contact point/s, may be through our Indian NGO’s or the Consulates and let the young women know by possible and identified means how to get help in case of need, from their own Indian Missions, or the NGO’s so identified. And the Indian Missions then in partnership with NGO’s could do the referrals. At least our women (at least those who need help) outside their own country will not be homeless or feel abandoned. Our community here has no dearth of resources to pitch in....together. We need to address these issues. MUZAFFAR (name changed) is a handsome 22-year old who lives in a middle class Srinagar locality. Over the past couple of years, he has developed a close friendship with a married woman of the neighbourhood who is separated from her husband. Her little children are very fond of Muzaffar and enjoy outings with him, but it is of course the sort of relationship that is frowned upon in a conservative society. Having known the young man’s family for several years, I can vouch for the fact that he is not involved in any way with the secessionist movement. Indeed, he holds the view — common enough, incidentally, among the generation that grew up amid the staccato rattle of gunfire — that economic development is what Kashmiris need rather than a changed political status. Nonetheless, Muzaffar has been picked up by the security forces several times and tortured. Each time, it turns out, his lady friend’s husband has reported him as a terrorist. For although the couple are separated, the man shares the male mentality so common across the subcontinent, that she is his property and that it is his right and duty to beat up any other male friends that she might have. The difference is that, in the peculiar circumstances of Kashmir, such a man finds it easier to get the security forces to do his dirty work for him. Any security force set to combat a guerrilla war thrives on information about who is covertly involved with one or other guerrilla group and so they lap up such tips and act on them expeditiously. Torture being the favoured method of security forces in not just Iraq, the typical reaction to such a tip about a young man like Muzaffar is that he is picked up and bundled into a closed security force vehicle and driven straight to a torture chamber. The forces’ logic is that they must extract information about the whereabouts of other members of the group and of weapons dumps before the group realises their fellow has been caught and changes hideouts. The result is that the torture victim's family is left searching high and low for him for perhaps a couple of days — or, at times, forever. Muzaffar has been treated to electric shocks and the application of chilly paste to wounds and other exposed areas of a naked body, apart from thrashing and humiliation. When the Border Security Force has picked up Muzaffar — twice so far over the past couple of years — he has been released after the first round of torture. It does not take long for them to figure out that the fellow is innocent — at least of the sort of crime they are trying to stop. The local police, on the other hand, are a different kettle of fish. The police picked up Muzaffar on his little nephew's birthday a few weeks ago and, although they too knew the fellow was innocent, they wanted money and other favours to let him go. Given the pattern of police forces in many parts of the subcontinent, the man who had reported him had also no doubt paid them. Muzaffar’s is not an isolated case. Unfortunately, this sort of thing has been almost a pattern through the traumatic 15 years that Kashmir has spent in the grip of turmoil. Property disputes and rivalry of one sort or another have all too frequently led to such malicious reports. The forces cannot know which complaints are genuine and which are motivated, unless they investigate. But such action only creates fresh bitterness and alienation among people who have nothing to do with secessionist politics or militancy. One must remain constantly alert to the fact that the extraordinary powers that have been given to the security forces in Kashmir can and do lead to abuse. The powers that be should never become complacent about these extraordinary powers. Although Dr Manmohan Singh’s government intends to repeal the draconian Prevention of Terrorism Act (POTA), the answer finally is to repeal all the special powers acts in Kashmir. The best road towards that is the peace process. It must not be allowed to lose momentum. The talks between the Foreign Secretaries of India and Pakistan over the next few days should push forward the process. This brings me to write that it’s indeed remarkable that unlike his predecessors, President A.P.J. Abdul Kalam does not believe in taking the traditional summer break. I'm told that he works on all days of the year and there is simply nothing like going to the two Presidential retreats in Shimla and Hyderabad. On the contrary, June has been a busy month for the President. Last week, he spent time with representatives from different faiths who’d formulated the Surat Spiritual Declaration (SSD). Several religious leaders now plan to get the people to a higher plane — to be spiritual and enlightened. Besides a Charter, the SSD plans to achieve this in the most practical way. It has prepared a CD — Understanding Religions — where each religion is highlighted. Jain Vishva Bharati Institute Vice-Chancellor Sudhamahi Regunathan has been working on this project for quite some time. The Union HRD Ministry should make it compulsory for every school and college to screen it. For details, contact the Jain Vishva Bharati Institute, II Floor, Nehru House, 4, Bahadurshah Zafar Marg, New Delhi-110002 (Ph: 51509015, 51509016). 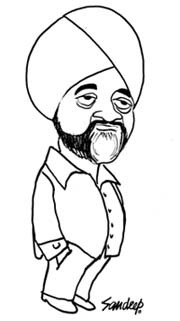 Gurdeep Pandher is writing Prime Minister Manmohan Singh’s biography. The 26-year-old Ludhiana-based web developer had early this year written a book on Kalpana Chawla entitled “Among The Stars: Life and Dreams of Kalpana Chawla” (Unistar). To mark World Refugee Day on June 20, a function will be held. One of the speakers is Mr Hashmatullah, an Afghan refugee living in India for more than 10 years. He would give a first-hand experience of what's it to be living in a state of refuge. He who is unchanged by praise or blame, who is silent, content with whatever he has, homeless, firm of mind, and full of devotion — that man is dear to Me. The senses cheat you day and night. Vedanta found that out ages ago, modern science is just discovering the same fact. Forgiveness is the true nature of the ascetic. Let devotion to God be your service and faith in His Name be your occupation. All wisdom lies in temperance, tolerance and charity.